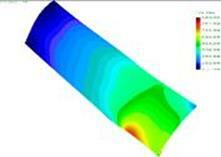 A stress analysis used to calculate weld repair limits. BWD Turbines team of experience personnel prepare customized purchasing and repair specifications that define the quality standards, processing parameters, acceptance criteria and critical dimensions required to repair hot section components. Supplier audits, source inspection and metallurgical qualifications further ensure that the repairs are completed to a high quality and components will perform reliably when returned to service. Specifications are used to state clear requirements and expectations between the purchaser and vendor. Supplier audits and source inspections reduce errors due to inadequate QA or shop procedures, technical knowledge and where required procedures are inadvertently or deliberately not performed. The amount of risk reduction is difficult to quantify and depends on vendor’s quality program but this is where the value is created. The potential costs avoided include lost revenue and the cost of replacement parts if a catastrophic failure or an unscheduled outage occurs. · Prepare customized purchasing specifications that define the quality standards, processing parameters, acceptance standards and dimensions required to repair the components with high reliability. · Audit the potential suppliers, evaluate their technical capabilities and quality programs. Identify the companies that are qualified to properly repair the parts. Assist in bid evaluations to select the best supplier. · Witness the critical manufacturing and inspection operations to ensure adequate quality and to expedite any acceptance or interpretation questions that arise. Review the final inspection, testing and heat treatment documents to ensure that the repair was completed satisfactorily. · Metallurgically examine a sample component or process control material that has been through the complete repair procedure. Provide an independent analysis and report on the suitability of the remaining components for return to service. A flow chart describing a vane refurbishment process.